Firebug 1.11 has been released and so, let’s take a look at some of the new features introduced in this version. Are you optimizing your page and using SPDY protocol? Cool, the Net panel is now indicating whether the protocol is in action. 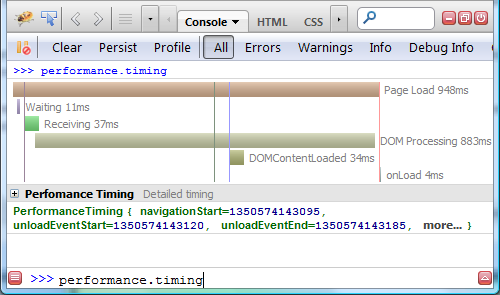 Another feature related to page load performance. If you are analyzing performance-timing you can simply log the timing data into the Console panel and check out nice interactive graph presenting all information graphically. Read detailed description of this feature. 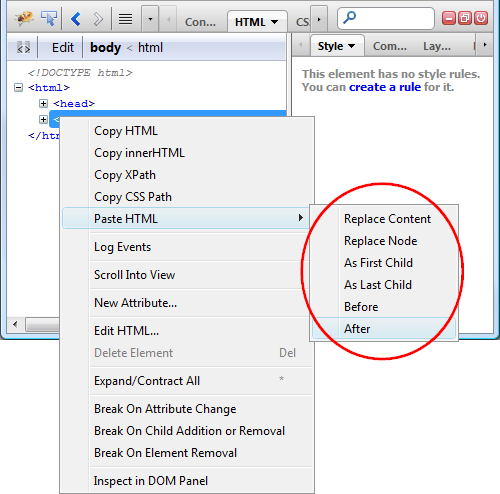 Firebug offers new side panel (available in the CSS panel) that allows quick execution of CSS selectors. You can either insert your own CSS Selector or get list of matching elements for an existing selector. In order to see list of matching elements for an existing CSS rule, just right click on the rule and pick Get Matching Elements menu item. The list of elements (together with the CSS selector) will be displayed in the side panel. If you are often including the same script (e.g. jqueryfying your page), you can create an alias. In order to see list of all defined aliases, type: include(). Note, that aliases are persistent across Firefox restarts. Read detailed description of this command on Firebug wiki. Firebug improves the way how message events, those generated by window.postMessage() method, are displayed in the Console panel. See detailed explanation of the feature. It’s now possible to quickly clone entire parts of HTML markup by Copy & Paste. Copy HTML action has been available for some time, but Paste HTML is new. Note that XML and SVG Copy & Paste is also supported! The way how console logs can be styled using custom CSS (%c formatting variable) has been enhanced. You can now use more style formatters in one log. See detailed explanation of this feature. Log Function Calls feature has been improved and it also shows the current stack trace of the place where monitored function is executed. Firebug also improves existing commands for querying DOM elements. It also means that the argument passed in must be CSS selector. So, for example, if you need to get an element with ID equal to “content” you need to use # character. The Command Line supports auto-completion even for built-in members of String.prototype or Object.prototype and other objects. There are many other improvements and you can see the entire list in our release notes. You can also see the official announcement on getfirebug.com. Wow, do you all ever sleep? :) Exciting! Wow! Great work guys! Keep going, you are all amazing! There is no screenshot for the usage of the $() and $$() commands. So I don’t understand how/where to use them. $() and $$() are built-in commands that can be executed on Firebug’s Command line. Open the Console panel and see the command line at the bottom. I love the include() command! I always wanted an easy way to load jQuery and some custom scripts on any website I visit (and I can’t be bothered to learn how to use Greasemonkey). I think jQuery is so ubiquitous that it ought to have a default alias. We were actually thinking about that, but what URL would be associated with the alias? Compressed jQuery, latest build, stable build,… ? So it would be uncompressed. Latest probably because it would be developers who use it, and it doesn’t require 100% stability since its not production. So either uncompressed latest, or uncompressed stable. True, you might be right. Please create a new report in our issue list so, it isn’t forgotten. Great work! Thanks for the updates!!!!!! This article’s TOC links don’t work on hacks.mozilla.org. E.g first links to fragment #SPDY, but the HTML has h3 id=”"spdy"”. 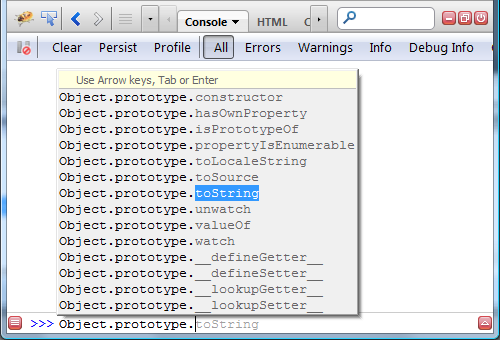 > some other way to access Firebug’s $ object? > E.g first links to fragment #SPDY, but the HTML has h3 id=””spdy””. Love every single person who contributes. Thanks for another great release and a massive year of continued Firebug brilliance.